Elsie (left) in Cusco, Peru’s main market with the Executive Chef from the Monasterio Hotel. Today’s interview is with culinary expert Elsie Mendez. I first met Elsie when we traveled through Kerala, India earlier this year and we reunited when she visited Las Vegas in May. Elsie has a love of Méxican food and culture that is unmatched in my experience. She blogs at Los Sabores de México and shares both her travel and culinary experiences. Carrying only her iPhone 5s, Elsie takes amazing photographs of the food that she encounters during her travels. Her ability to tell a story by combining those photos with her deep knowledge and understanding of food is amazing. I highly suggest a visit to her site. It is in Spanish, but Google Translate works very well and the photos are guaranteed to make you hungry. Now on to the interview! I thought it was a great idea, but I had never written as a journalist or blogger before and didn’t know how to do it, so I asked him to help me with the articles and content for the site. After almost four years (I started the blog on Nov 2010) I feel more secure and comfortable with my style of describing and writing about my trips. Today we don’t just talk about México and it’s food, we travel around the world discovering the flavors of México and how our ingredients and products are part of other culinary cultures. Breakfast in Santa Fe de La Laguna in Michoacán. I think my most memorable experience was in Michoacán, México since that was where my boyfriend and I confirmed our relationship and where Carlos inspired me to publish the first article for Los Sabores de México. For that reason I think it was the most beautiful experience I have had. Also, the trip I made with USA journalists as a host through three different states in México was fantastic. I was responsible for showing them the best of the best of my country. 3. What was the most disastrous day you spent on the road? How do you cope when everything seemingly goes wrong while traveling? Thankfully I cannot remember a day like that. Maybe I am a lucky person or have everything under control all the time. Haha. I think you can’t expect perfection all of the time when you are traveling. Things can always go wrong with no warning and for no particular reason. I traveled with my four kids for many many years and I learned you have to relax and learn not to be upset when things are not perfect all of the time. 4. Can you tell me what makes your blog unique? I think our real and special quality is the gastronomic and culinary culture we have as a heritage in Mexico. Mexican palates are very open to tastes from all around the world. I think this makes Mexicans unique and I represent them. Mexican people love to travel and we spend a lot of money on food and beverages. We love to discover and share with our friends and family the places and food we tasted during our trips. You will find Mexican products and ingredients on every corner in both little towns and big cities all around the world. We have influenced cuisines from all over the globe with our red tomato, chiles, vanilla and cacao. It is very, very difficult to answer this question. I still have many places in México and the rest of the world to discover. My favorite place in México changes constantly as I travel around the country and explore new parts. I love México, but I have also had amazing times in China, India, Canada, USA, Peru, Argentina, Chile, Brasil and in many parts of Europe. Every country has something special for me so it is impossible to choose which one is the best. Perhaps my favorite is the one I am in or have visited most recently. Actually, no I can’t choose! 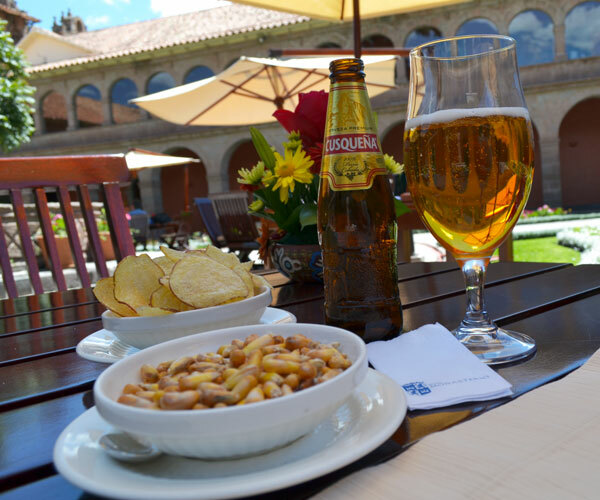 Fried potatoes, corn and beer at the Monasterio Hotel, Cusco, Peru. Food is the essence of culture and the identity of a place, of a country. Go and discover the local food with local people. If you come to Mexico go to the market, ask for non-tourist places at the hotel. I love to save my money so I can visit the best restaurant in the city or country as a way to say farewell. I often use the Michelin Guide and the 50´s Best List to choose, but of course I also ask the locals as well. My mother, my family, my Méxican food, flavors, aromas and colors of the culinary world. The chefs and culinary experts are my heroes and now my friends. I am inspired when I learn and discover how México is present in every part of the world. I often receive emails and messages from very important chefs and personalities from the culinary world asking me for advice about México and it’s various regions and cuisines. It is exciting to see how popular our food has become around the world. Carlos Dragonne and Elsie with Chef Joel Robuchon on Mexican Mother’s Day 2014. (May 10) Elsie was invited to celebrate her day with him. The first time I was invited to have a special dinner at Robuchon restaurant in Las Vegas. MGM Resorts International asked me to bring my close friends from Mexico to be part of a special trip to Las Vegas. We stayed at the Aria Hotel in amazing corner suites and when checking in found out that we were going to have a special meal at Maison Robuchon. Everybody was so excited about the dinner, but we never imagined that in the middle of the meal Chef Robuchon would greet us. We were surprised by his visit and the fact that he was personally cooking for us. The day after the dinner I was supposed to interview Chef Rubuchon by myself, but Carlos had to step in because I was so excited that I couldn’t say a word! After the interview, the chef gave me a signed copy of his most important recipe book. He is my hero and my favorite chef in the entire world. I love travel all the time. I love to discover the world and its food and to be surprised by new places and the people who live there. One day I dreamed that I was traveling and when I woke up I told myself that I will do it until I die. I feel free and happy when I travel. Grilled Octopus with Guajillo Salsa from Anona Neobistro in Mexico City. Suitecase. I think you can still remember my big luggage that I used during our trip in India. (Shawn: Let’s just say Elsie travels in style!) My essential things are my special medicines and my iPad Mini which carries my music and books. I also carry an iPhone 5s to get amazing shots of food. Dreaming is good. Working hard to make those dreams a reality is very rewarding. Don’t feel afraid to go to a place far away from your home by yourself. In every place you can have the opportunity to meet someone amazing who will be in your life forever like you Shawn, my friend Roxanne in India, Merushka in Africa or Lydia in Spain. I want to sincerely thank Elsie for taking the time to do this interview! I am now starving so it is time to go eat some Méxican food! Have a great weekend! Thank you very much for this interview! I feel happy and honored for it. It was a pleasure to meet you and now have you as one of my best friends in the world! See you soon in Mexico to have a delicious Mole! I can’t wait to make it there and to try the Mole! Thanks again for participating and sharing the food of Mexico with my readers.